-Well, it was a matter of time before the surprisingly successful 2012-2013 Providence College Friars were no longer able to make a magical comeback and keep playing basketball. 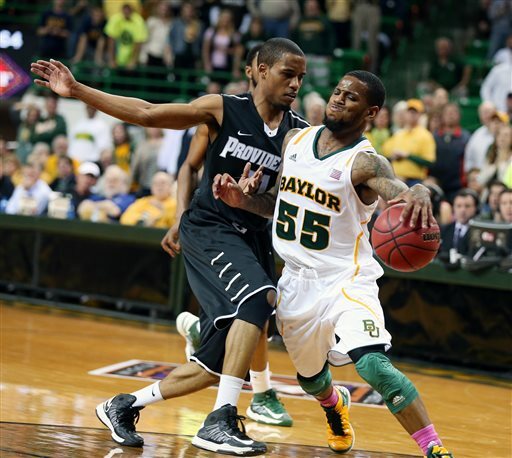 The Baylor Bears, led by Pierre Jackson, were stoic down the stretch, unfazed by the Friars continuous attempts at a comeback, and making all of the plays necessary to move onto the 2013 NIT Semifinals as Madison Square Garden. -Coach Cooley deserves an exceptional amount of credit for what he was able to do with this Friars team. He had to work with more player combinations than possibly any other team in the country. The Friars brought 6 scholarship players to the Puerto Rice Tip-Off at the start of the season. Then, Cooley had to work Vincent Council, Kris Dunn, and Sidiki Johnson back into the lineup. Then, the Friars lost Johnson and had to adapt again. Then, they dealt with an injury to Bryce Cotton, a few stomach bugs for Kris Dunn, some disciplinary issues with Council, and a countless amount of other variables that led to Cooley receiving this praise from me. Stand up Coach, you deserve a ton of recognition and appreciation! -Pierre Jackson is ruthless. He is the example of what I wish Vincent Council developed into. Never fazed, always under control, and always making the best decision. -LaDontae Henton needs to become more consistent, or he’ll be coming off of the bench in the 2013-2014 season. -Kadeem Batts finished the season just as he started it, putting up numbers and controlling the paint. Batts amassed 20 points (9-17 shooting), grabbed 8 boards, and had 2 assists. Kadeem Batts turned into a better player than I ever imagined he would become. Cooley’s staff needs to be recognized for his development, but Kadeem deserves a lot of that credit too. If Batts gets better heading into the 2013-2014 season, he will be drafted. -Bryce Cotton led the Friars with 23 points, however he went dead cold in the last 10 minutes of the 2nd half (when they needed him the most). As the NTCF faithful may know, my affinity for Bryce Cotton has decreased as of late and I’ve begun to criticize him for some selfish play and poor decision making. I hope that Bryce continues to improve, but I think that the Friars will have more talented options next season. Cotton will most likely get drafted (thanks Q), but Batts will be a better pro. -Josh Fortune needs to improve defensively, offensively, with decision making, and his overall basketball IQ or his playing time will quickly diminish with guys like Brandon Austin and Ricky Ledo competing for playing time. -You have to commend the Baylor Bears. They played a hell of a game. Jefferson was a beast down low and Jackson was a true conductor on the floor. -However, I can’t complain. The Friars were able to play 3 more games than anticipated and have some momentum to build on this offseason. -Stay tuned to NTCF for my 2012-2013 season review and 2013-2014 season preview post. Nicely done with these all season long Matty.